Three data sets derived from 5– or 6-year field experiments at Merbein (Victoria), Dareton (New South Wales) and Loxton (South Australia) were used to assess the relationship between yield of own-rooted or grafted grapevines and electrical conductivity of the saturated soil paste extract (ECe). This involved a non-linear least squares fit method to determine the threshold of ECe at which yield begins to decline and the slope of the yield reduction with increasing ECe above that threshold. Threshold and slope are the two key parameters in this piece wise linear model of grapevine response to salinity. The soil ECe values were integrated to take account of both spatial and temporal variation in soil salinity within the profile. The ECe threshold for own-rooted Sultana at Merbein in the Sunraysia region was found to be 2.3 0.2 dS/m and the slope of yield reduction above the threshold was 8.9 1.2 % per 1 dS/m increase in soil ECe. 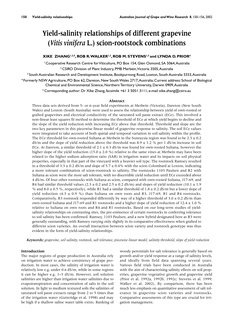 At Dareton, a similar threshold of 2.1 0.3 dS/m was found for own-rooted Sultana, however the higher slope of the yield reduction (15.0 2.0 %) relative to the same vines at Merbein may have been related to the higher sodium adsorption ratio (SAR) in irrigation water and its impacts on soil physical properties, especially in that part of the vineyard with a heavier soil type. The rootstock Ramsey resulted in a threshold of 3.3 0.2 dS/m and slope of 5.7 0.4% with the scion Colombard at Loxton, indicating a more tolerant combination of scion-rootstock to salinity. The rootstocks 1103 Paulsen and R2 with Sultana as scion were the most salt tolerant, with no discernible yield reduction until ECe exceeded about 4 dS/m. Of four other rootstocks with Sultana as scion, compared with own-rooted Sultana, J17–69, and R4 had similar threshold values (2.3 0.2 and 2.5 0.2 dS/m) and slopes of yield reduction (10.1 1.9 % and 8.0 0.5 %, respectively), while R1 had a similar threshold of 1.8 0.2 dS/m but a lower slope of yield reduction (4.3 0.9 %) than Sultana on own roots and R3, J17–69, R1 and R4 rootstocks. Comparatively, R3 rootstock responded differently by way of a higher threshold of 3.0 0.2 dS/m than own-rooted Sultana and J17–69 and R1 rootstocks and a higher slope of yield reduction of 12.4 1.0 % relative to Sultana on own roots and R4 and R1 rootstocks. Based on our long-term studies of yield-salinity relationships on contrasting sites, the pre-eminence of certain rootstocks in conferring tolerance to soil salinity has been confirmed. Ramsey, 1103 Paulsen, and a new hybrid designated here as R3 were generally outstanding, with Ramsey varying only slightly in its comparative effectiveness when grafted to different scion varieties. An overall interaction between scion variety and rootstock genotype was thus evident in the form of yield-salinity relationships.